$42 Promotional Gift Card available on this product! We’ve listed the height ranges for each size below. Choose a size that works for your height and also one where your own chest and belly sizes are within a few inches of the max sizes listed below. For example, I’m 6’ with a 46” chest and a 42” belly, so I’d choose a size XL. Those with average proportions will choose the size they typically wear in men’s clothing. About the Custom Leather Vest: This vest is styled very much like other cruiser style leather vests we sell. It has three storage pockets outside and one very nice inside pocket for your technology or eyeglasses. 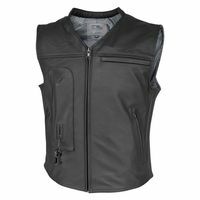 The buyer for this vest will be a person that doesn’t want to wear a fully armored riding jacket and prefers the style of just a vest. The vest has two zippers in the lining to allow you access to the back leather of the vest to sew on any custom patches you like. The styling is simple and sharp.